Fujifilm has announced two new F-series EXR point-and-shoot cameras, the F900EXR and the F850EXR. While both cameras feature similar megapixel counts (16) as well as the same EXR Processor II, 20x optical zoom lens with CMOS-shift Image Stabilization, EXR auto mode, a 3.0-inch LCD display, full manual controls, and special features like Motion Panorama 360 and Advanced Filters; there are a few key differences. The F900EXR costs about $100 more than the F850, and includes the newer EXR-CMOS II image sensor, which includes Phase Detection AF (Auto Focus) for more accurate color representation and quiet autofocus during Full HD 1080p video recording. The F900 also includes built-in Wi-Fi for Wireless Image Transfer to computers, tablets, and smartphones, and, as of January 2013, boasts the world's fastest Intelligent Hybrid AF at 0.05 seconds! The F900EXR can shoot in RAW, JPEG, or RAW+JPEG formats and has a high-speed burst shooting capable of up to 11 frames-per-second speeds (to a maximum of 5 speeds). 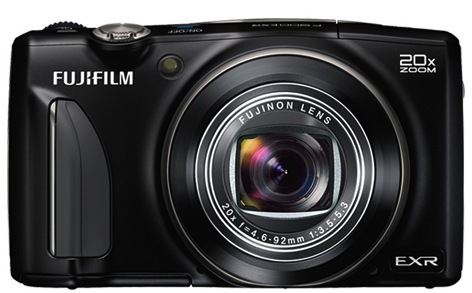 With color choices like champagne gold, black, red, and indigo blue, the Fujifilm FinePix F900EXR will be available in March (2013) with an MSRP of $399.95.